Our next CWC general meeting is May 21st, 2019 at 7pm (ET). If you are a current member, your annual dues are payable one year from last renewal date. SIGN IN to the membership database to check your renewal date on your profile. Click HERE to login. LOG IN button will be in the top right hand corner of the Join Us page. OR Contact the membership chairperson if you are unsure of your status. For prospective members, the CWC sponsors a wide range of activities that nurture, support and promote the writing life. This includes contests, critique groups, monthly meetings, and periodic workshops. Your membership dues help fund all club activities. Please join us in supporting writers, readers and literacy in our community. For more information on membership and joining the Charlotte Writers' Club, click on Membership. To receive our monthly newsletter, type in your email below and select 'Go'. Select 'CWC Member Contacts' if your are a current member, or 'Non-Member' if you are still thinking about joining. The newsletters and meeting recaps contain important information and announcements. 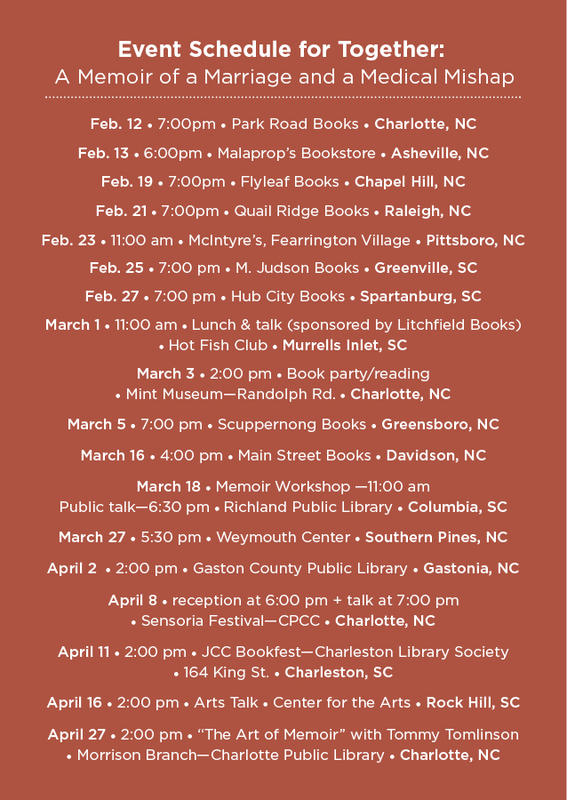 Welcome to the Charlotte Writers’ Club website! The Charlotte Writers' Club (or CWC, as our members affectionately call it) provides a great opportunity for writers of all forms—and there are so many—to meet and discuss the latest trends, commiserate on projects, find critique groups, and participate in contests and workshops. This club is for you, the writer, to help develop your craft and keep the words coming. Sign up for our free newsletter to stay up-up-to date on the latest CWC speakers, contests, workshops, and member kudos. This club has something for everyone. Come meet fellow writers—poets, novelists, creative writers, short-story writers, essayists, article writers, journalists, dramatists, editors, fablers, ghost writers, historical writers, lyricists, playwrights, reporters, rhymers, satirists, scriptwriters, sonneteers, autobiographers, biographers, and more—story tellers of all kinds. April 24th - 7pm-9pm - Waterbean Poetry Night at the Mic in Huntersville. April 27th - 7 pm- Journalism Under Siege or Not with David Boraks news journalist WFAE, Mark Washburn, media journalist Charlotte Observer, Tommy Tomlinson, podcast journalist and author of The Elephant in the Room and Pam Kelley, former Observer reporter and author of Money Rock. NEW VENUE: Brick Row, 19725 Oak Street in Cornelius. (behind the police station in Old Town). Doors will open at 6:30 p.m. Charlotte Writers’ Club North invites you to meet the press for a panel discussion. April 27th - 8am - 6pm - The North Carolina Writers' Network 2019 Spring Conference - For more info and to register, visit: North Carolina Writers' Network. April 27th - 9am - 5pm - WRITE NOW! 2019 -one-day writing conference, at the McKimmon Conference and Training Center (1101 Gorman Street) on the campus of N.C. State University in Raleigh. May 21st - Elizabeth Simpson Smith Short Story Contest winners announced. SAVE THE DATE for our CWC SPRING SOCIAL - JUNE 8TH - 4pm-7pm - More information will be posted as event details are determined. Literary Latte Podcast: The podcast with a Southern accent on writing. Member Kris Wampler looking for authors to interview - Visit his Blog to contact him. 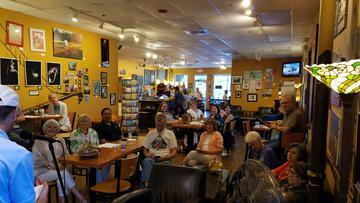 Members can REGISTER to read at one of these OPEN MIC Nights at Mug's Coffee. If you aren't reading, come out and support your fellow writers. Please NOTE: This is NOT a publicity event for our authors. The goal is to support our members as they practice reading in public. Kudos To Our Members!!! Our members are working hard and we want to share their accomplishments in the newsletter and on our website's blog. Submit your Kudos* to the Newsletter and the Website. The Policies and Procedures for the Charlotte Writers' Club can be found HERE. One of our many successful events from February 2017 was our Bookfair at Barnes and Noble. Click HERE for news coverage.